Are you looking for a used plotter? We can help you get a solid plotter for your business without having to pay through the nose because the plotter is new. We have different options on plotters, from 24″ to 60″ plus. If you need a plotter that produces prints that go inside or outside we can help. We have units that are great for in office prints, or UV resistant plotters. 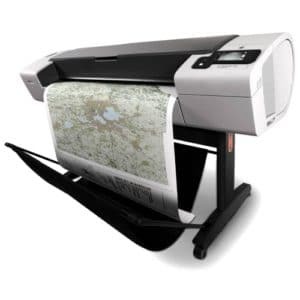 Getting a used plotter is often 1/3 to 1/4 the cost of a new plotter. We recently sold one that had less than 5,000 feet ran on it and cost the client about $5000 rather than the $14000 the new version of the same plotter cost. Getting a used plotter is great for clients who want a plotter for convenience, and not one who runs hundreds of jobs a day. Normally, the more the plotter is used, the more a new plotter makes sense than a used plotter. We would love to help your company find a plotter. With prices starting at about $1,495 for a plotter, you can get your team working and getting the jobs that help pay the salaries of your people. We look at plotters as a way to get the work you want to get or get out the message you want to get. If that can be done from a used plotter rather than a new plotter, why not save thousands of dollars in the process?